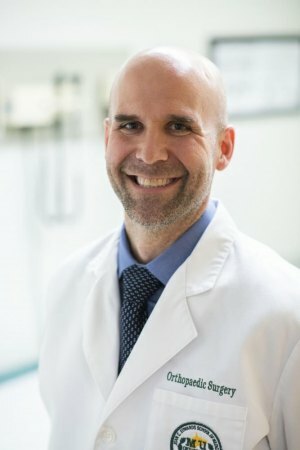 HUNTINGTON, W.Va. – Marshall University Joan C. Edwards School of Medicine, Marshall Health and Cabell Huntington Hospital medical and dental staff welcome Matthew W. Bullock, D.O., MPT, to their orthopaedic surgery teams. Bullock, a board-certified, fellowship-trained orthopaedic surgeon, has been named an assistant professor in the department of orthopaedic surgery at the Joan C. Edwards School of Medicine. He is certified by the American Osteopathic Board of Orthopaedic Surgery. He earned his medical degree from the West Virginia School of Osteopathic Medicine in Lewisburg, West Virginia, before completing a residency in orthopaedic surgery at Mercy St. Vincent Medical Center in Toledo, Ohio. Bullock’s advanced training includes an orthopaedic adult reconstruction fellowship at Wake Forest Baptist Hospital in Winston-Salem, North Carolina. He has served as an assistant professor of orthopaedic surgery at Wake Forest School of Medicine and Baptist Health since 2015 and an orthopaedic adult reconstruction surgeon at W.G. (Bill) Hefner VA Medical Center in Salisbury, North Carolina, since 2017. A West Virginia native and two-time alumnus of West Virginia University in Morgantown, Bullock worked as a physical therapist before pursuing a career in medicine. Bullock specializes in all aspects of hip and knee replacement, including revision surgery and infections. He is also skilled in minimally-invasive total hip replacement and robotic partial knee resurfacing. Bullock joins joint replacement specialists Ali Oliashirazi, M.D., and Felix H. Cheung, M.D., at Marshall Orthopaedics, an outpatient department of Cabell Huntington Hospital, located in the Marshall University Medical Center at 1600 Medical Center Drive in Huntington. To schedule an appointment, call 304-691-1262.